The Stygian Owl (Asio stygius) is very difficult to see but I can hear it regularly calling near my home inside the Pululahua Geobotanical Reserve. This bird is very secretive and every time that I try to get close to his roost he flies before I can see him. For now I can only get close enough to hear his calls! The photo below was taken at Parque Condor which is a great raptor rescue center near Otavalo. Visit Ecuador for great birds and support our conservation efforts. 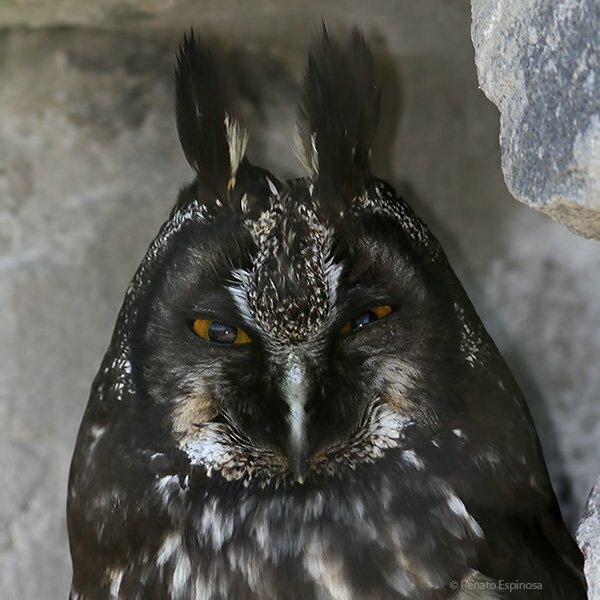 Such a cool looking owl- it might even win the award for being the most “goth” of the Strigidae. Great photo and great owl! Thanks for the link to the condor center, too. I liked watching the video of the condors. Thanks for your feedback. I am considering putting up some nest boxes around to increase my chances of a sighting. I am just now quite satisfied with the photo of a jailed bird! Great Green Heron on Birding is Fun!